An inguinal hernia can develop when there is a defect in the lower abdominal wall just below the inguinal ligament. In the indirect hernia there is a congenital defect of the tube ( in doctor lingo: “processus vaginalis”) through which in late embryonic life of the male the testicle migrated into the scrotum. Not infrequently this tube stays open, although in normal development this should disappear on its own. The development of a hernia depends on the aging process and the size of the persistent processus vaginalis. A bowel loop or a piece of intra abdominal fatty tissue can push through this opening. Whatever pushes through will end up in the scrotum. With a direct hernia the defect is directly in the abdominal wall. It is not congenital, but the person came down with the hernia. The factors that contribute to hernia development are the quality of the connective tissue and whether the person is overweight (pressure dependent from inside). Here is a link showing the different hernias in the inguinal area. There is a local piercing pain when a hernia suddenly enlarges. As the content of the hernia irritates the ilioinguinal nerve, which is close to the hernia, the patient may feel severe abdominal pain in the right or left lower abdominal wall. The pain locates to the lower abdomen on the side of the hernia. At the same time there is a bulging mass locally and if it is a big hernia, some of the mass may reach into the scrotum on the right or left side. Some of these hernias are the ones where the abdominal wall can catch a bowel loop in the opening. There is a danger of strangulation of the bowel. The surgeon will carefully examine and attempt to push back the content of thee hernia. 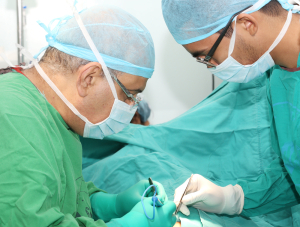 If this is possible, then there is time to fix the hernia on an elective basis and the patient can wear a hernia truss prior to the surgery to prevent deterioration of the condition. However, if the surgeon can not reduce the hernia, then the condition is an emergency. In this case the patient is taken to the operating room right away. There are only 4 to 6 hours before the danger of irreversible gangrene of the bowel would set in. Surgery might be done by the laparoscopic method through three stab wounds. A plastic mesh, which is rolled up, is brought in and is stapled in place over the hernia defect of the abdominal wall from inside under television camera supervision. Following this the instruments are withdrawn and the patient can go home either on the same day or the following day. In the past with conventional incision the recovery took 7 to 10 days!